Close your eyes… focus on your breath… do not try to change it, just focus on it. Now, I want you to imagine yourself lying in the soft grass. As you rest, you notice a tree next to you; this tree has big, beautiful leaves. Also, notice that there is a stream nearby; you are resting near the bank. As any thought enters your mind, imagine it is a leaf on the tree. Notice the wind and allow the thought leaf to blow from the tree to the stream and float away. Do not judge your thought; just allow it to leave your mind as quickly as it entered. Continue to focus on your breath… let the thoughts come as they naturally do, and let them float away as a leaf in the stream. Just, breathe. Hearing these words from a therapist was my introduction to mindfulness. What a relaxing introduction. I have since practiced mindfulness in different ways, and I am beyond excited to practice it with my son as he grows. Why? Well, because it turns out that meditation has incredible health benefits for adults AND for children! One study, published by the Journal of Pediatric Nursing, found that elementary school children who participated in a meditation program experienced significantly lower social anxiety, aggression, and salivary cortisol levels than their peers who did not participate. A study published by the Journal of Child and Family Studies evaluated mindfulness-based yoga in preschool children. They tracked attention, delay of gratification, and inhibitory control and found that the participants benefited significantly. The authors also note that the children who were at risk from dysfunctional self-regulation benefited the most from the yoga exercises. If my personal experience with mindfulness did not convince me, these studies (and countless others) surely have. Mindfulness does not need to be time intensive. Generally, it is recommended that preschool children practice for a few minutes a day while grade-school children practice for three to ten minutes twice a day. Older children, teens and adults can practice anywhere from five minutes to an hour, based on preference. 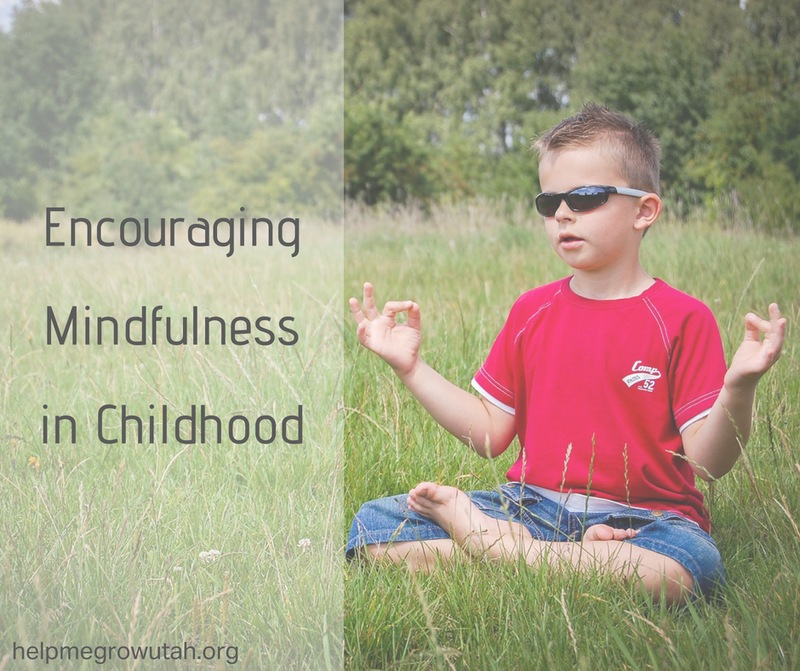 One of the more common practices for mindfulness in children is yoga. There are many different ways to include yoga in your child's life. Animal poses such as cat, cow, downward dog, cobra, etc., are simple enough that your child can accomplish them. Your child may also enjoy tree or mountain pose. For pictures and more pose ideas, you can visit this website. For videos that will lead you and your children on a less quiet yoga adventure, you can view this Youtube channel. If yoga is not your thing, there are multiple other ways to practice mindfulness with your children. Take Five: Have him inhale to five as he lifts each finger one by one, then exhale as he closes each finger one by one. Focus on Senses: Pause and have her pay close attention to what she can smell, see, hear, feel, and taste. Mindful Jar: If you have a water bottle and a few simple ingredients, this is a breeze to make. (This Pinterest board has many sensory ideas including calm down bottles). Have him imagine that the bits of glitter are his thoughts/emotions and watch what happens when the jar is still. You can also try this in real time when your child is struggling through emotions, or in a time out, as a calm-down technique. Mindful Walk: Turn a walk into an adventure; have her focus on senses to find birds, bugs, and animals. Muscle Awareness: Have him squeeze and relax all of his muscles in turn starting from the head, going all the way to the toes. Mindful Eating: When eating, have her focus on the five senses and on her body's physiological response to food. A great script can be found here. What mindfulness activities have you tried? We would love to hear more! If you try and of these, let us know how your children respond by commenting below.